In Memory of Len Zgonina: Fire Fighter, U.S. Army Veteran, Corporate Pilot, Professional Musician, Welder and Steel Fabricator, Machinist, Cabinet Maker, Photographer – – – and friend. Leonard “Len” Paul Zgonina, who was one of the earliest local and active volunteers in the First Aero Squadron Foundation, has just “headed west” on his final flight. 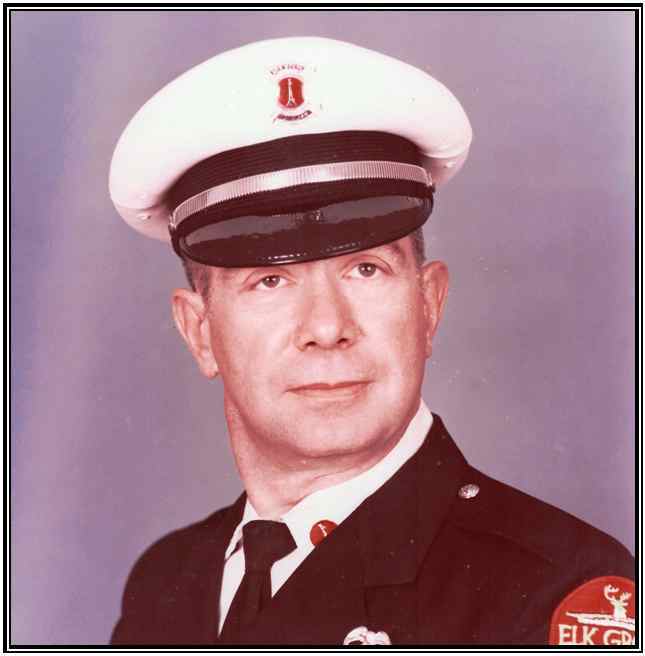 Len was born in Chicago, Illinois, and lived most of his younger working years in that city’s nearby suburbs, where he became a firefighter in the Village of Elk Grove. After 25 years as a fireman, Len retired and moved to an Air Park only 3 miles north of Columbus, NM. 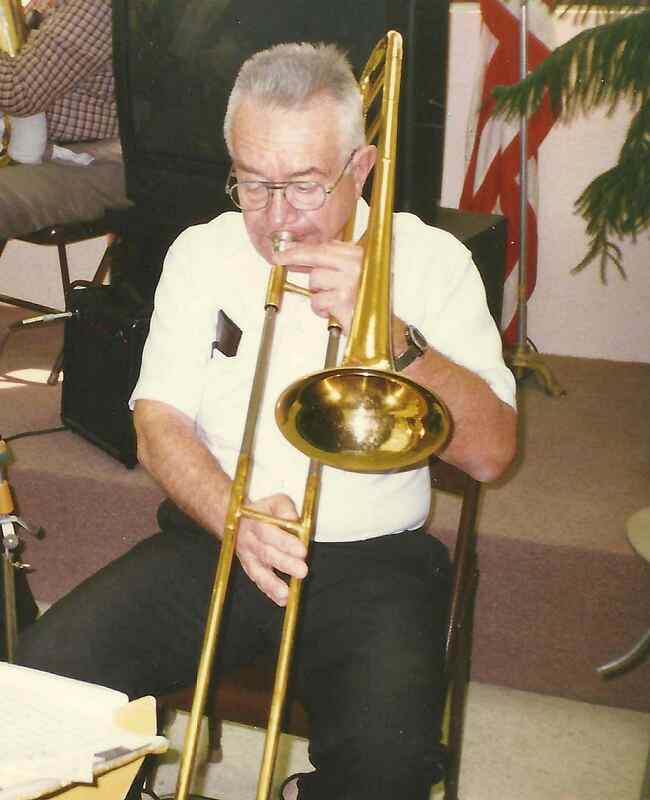 He deeply loved flying, photography, playing his trombone in local bands, his discussion groups and his incessant computer research and study. Len was always intent on pushing his boundaries and learning something new. 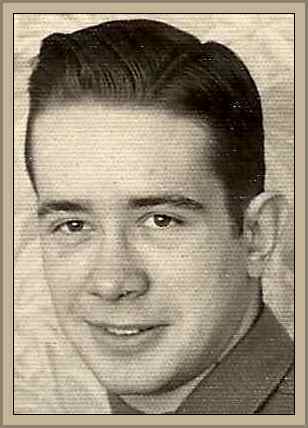 In between his studying, he could almost always be found working to fabricate some new piece of metal art out in his hangar’s machine shop, or working with wood to build someone or a dear friend a new cabinet or piece of furniture. For a short time he agreed to come out of retirement, and took on the task of Fire Chief, in the nearby village of Columbus. He also personally disassembled for safekeeping the former Columbus Airfield’s Beacon Light and its high tower and volunteered to help move its old FAA flight facility building to its present location at the Columbus Historical Society’s Depot Museum. 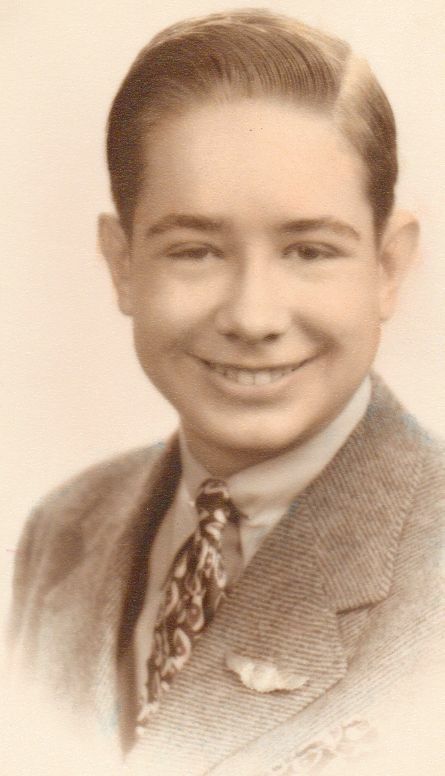 Although his children married and remained back in the Midwest, Len nevertheless remained in close contact with them from his Air Park home near Columbus, regularly flying his own Cessna airplane back to Illinois and Wisconsin to visit them. Len will be sorely missed for his memorable sense of humor and good nature. He is survived by his wife of 60 years, Maria; his daughters: Donna Rausch of East Troy, WI; Janet Fleischauer of Zion, IL and Maria Rausch of Eagle, WI, his grandchildren: Amanda Donnelly, David Daniels, Joseph Fleischauer, April Fleischauer, Timothy Fleischauer, Jessica Fuchs, Elijah Rausch, Leonard Rausch and Isabella Rausch; Great-grand children: Andrew, Connor, David Jr., Lily, Dylan, Jack, Michelle, John, Jonathon, Michael, Evan, Cole and Farrah; his Brother Raymond Zgonina, other relatives and many good friends. He and his wife, Maria, lost their only son, Joseph, still in his twenties, many years ago. Len, at left by the Singer Corporation’s Twin Beechcraft King Air, started flying seriously in 1969 and became a licensed pilot in 1970, acquiring his Instrument Rating in 1972, his Commercial License in 1975 and his multi-engine Rating in 1979. 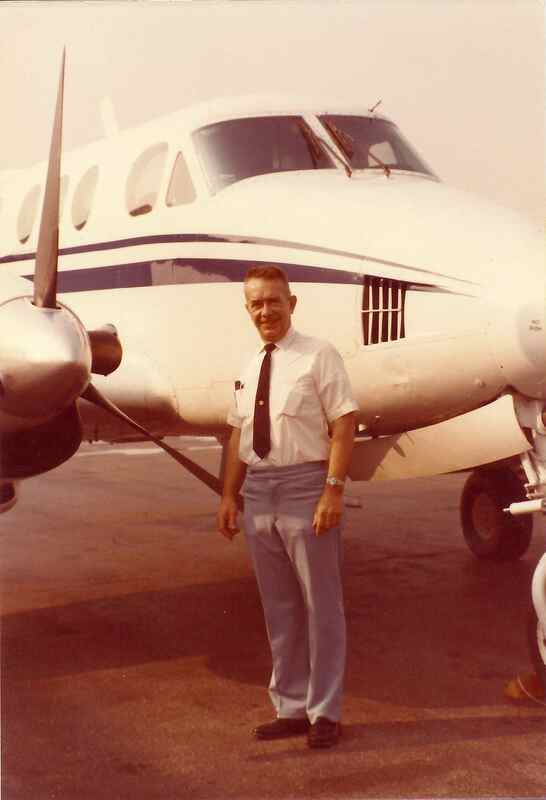 This photo was of Len as a Corporate Pilot in 1982. Once he’d earned his Commercial license he began flying the large Beechcraft ‘King Air’ twin engined prop-jet plane at left out of Chicago for the Singer Sewing Machine Corporation. Their frequent trips took him all over the United States. Len had dreamed of flying as far back as he could remember, so this particular job was extremely satisfying for the former fire fighter. In addition to his love of aviation and its history, Len also developed his skill at photography to the point where he actually became a professional in the field, a vocation at which he so excelled, that he even became an instructor. Len also learned to become a welder, finally opening his own business in that trade. He became highly skilled in every specialized welding technique in that profession. In retirement, he also became an expert wood-working craftsman. Len designed and built the entrance gateway to his beloved Columbus Air Park. 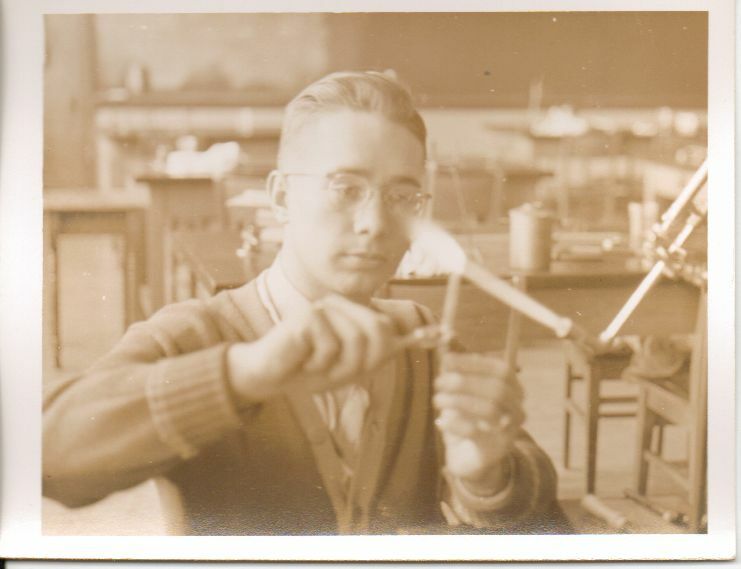 At left is Len as a young teen proudly wearing his souvenir pilot wings and at right he is seen working in his High School Physics Lab. 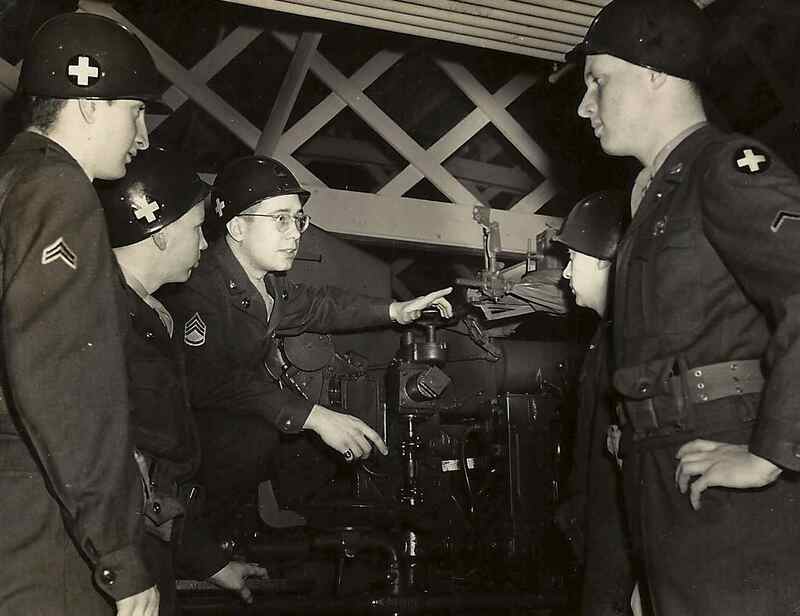 At the right below is Army National Guard Staff Sergeant Len (in glasses 3rd from left) instructing his men on the operation of a large artillery piece. 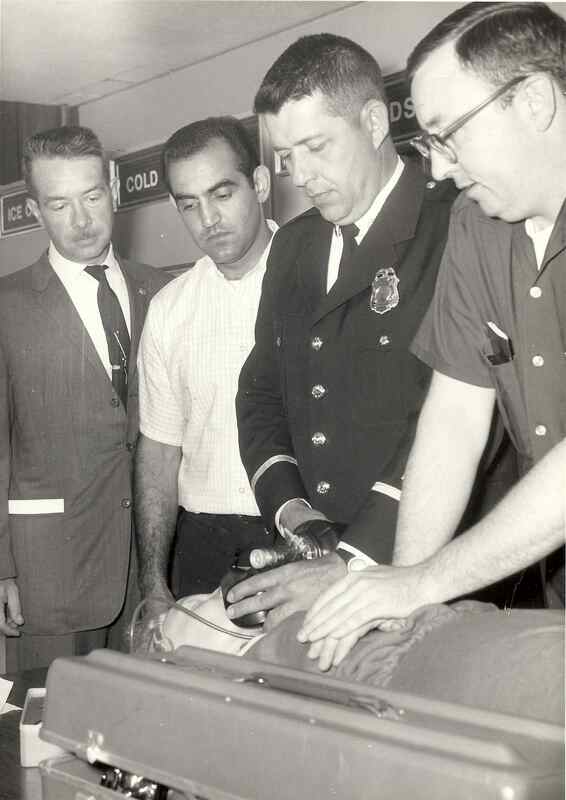 At the left below is Len, on far left in photo, being instructed in CPR while a Fireman. 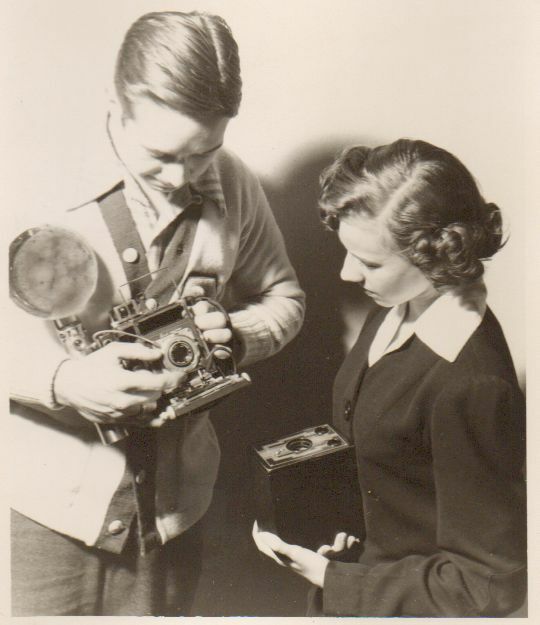 Below left is a photo of young Len as a Commercial Photographer and below right he is shown instructing one of his students in the use of a Speed Graphic News Photographer’s Camera. 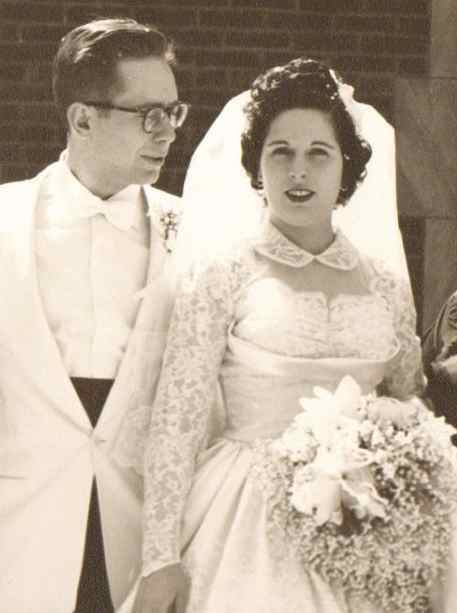 Left below is Len and his wife, Maria, on their wedding day in 1954 and below right is a recent photo of one of his grandsons, David Daniels, who worked his way up from an enlisted man in the Navy to become an Officer in the U.S. Navy’s Seabees. 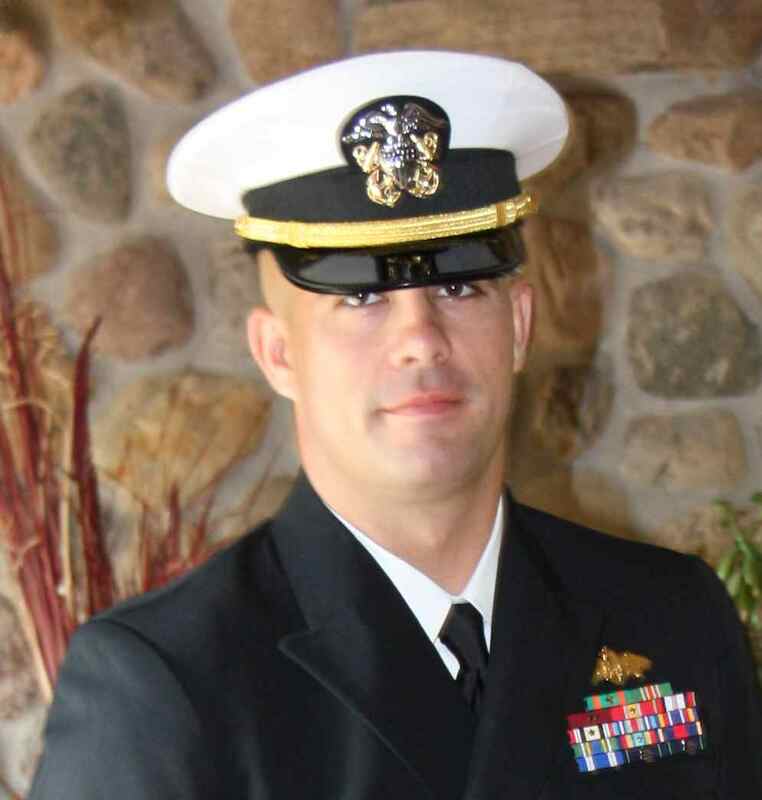 Young David learned the construction trades used by the Seabees from both his father and grandfather, Len. 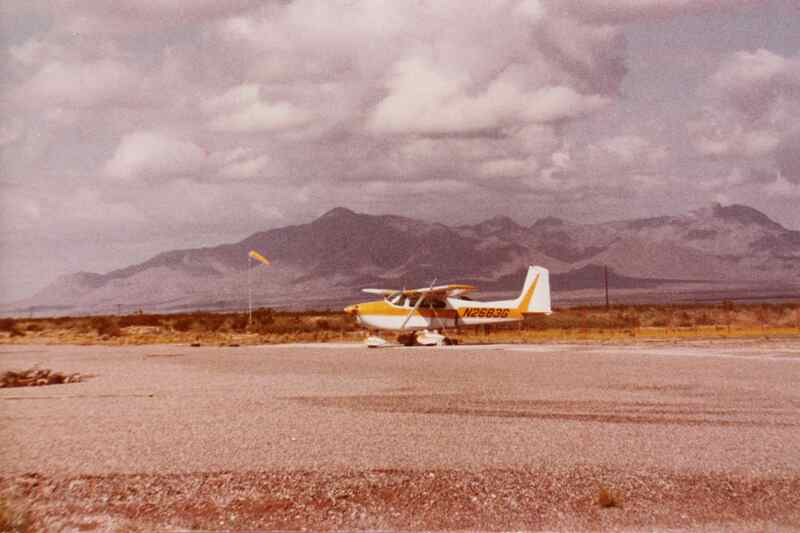 In fact, David actually helped his grandfather, Len, build his New Mexico Air Park home! 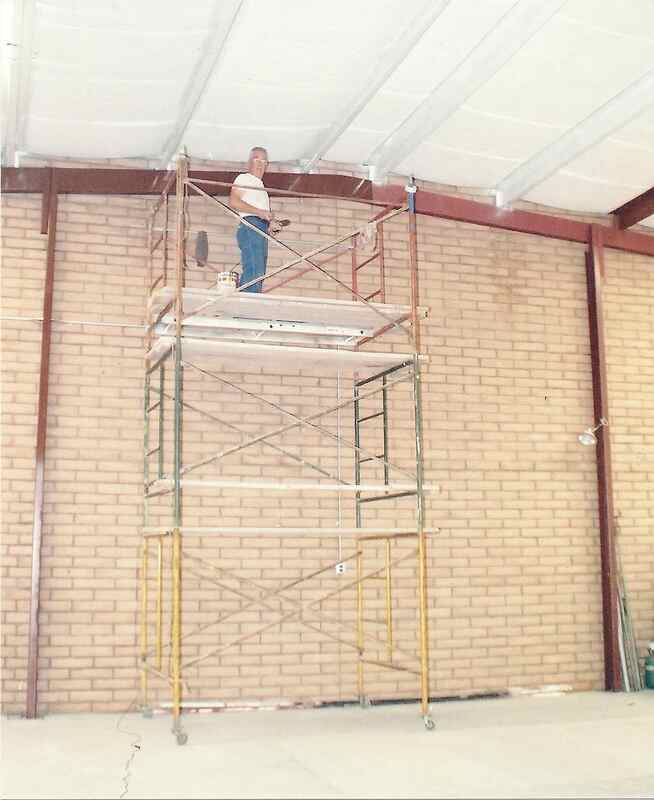 Below left shows Len atop his scaffolding while engaged in building his aircraft hangar at Hacienda Sur Luna Air Park North of Columbus. He not only built his large home and hangar, but designed them as well, using his steel fabricating experience and drafting expertise. Below right shows one of Len’s other great pleasures, one of playing in a local band, in this case at the American Legion Hall in Deming, NM. When in High School in Chicago, Len rowed on the Lincoln Park Crew’s racing team. Len fulfilled his dream to retire and move to New Mexico, to build his own home, one of his own design, and which would be situated at an Air Park, one where his plane would be in its own hangar adjacent to his home. With this arrangement, Len could – and regularly did – start up his airplane, taxi to the nearby runway, and take off for distant places. Len was quite modest about his remarkable and multifaceted careers. While he rarely spoke of his own manifold accomplishments, he was always ready to exult about his children and grandchildren, and their achievements. 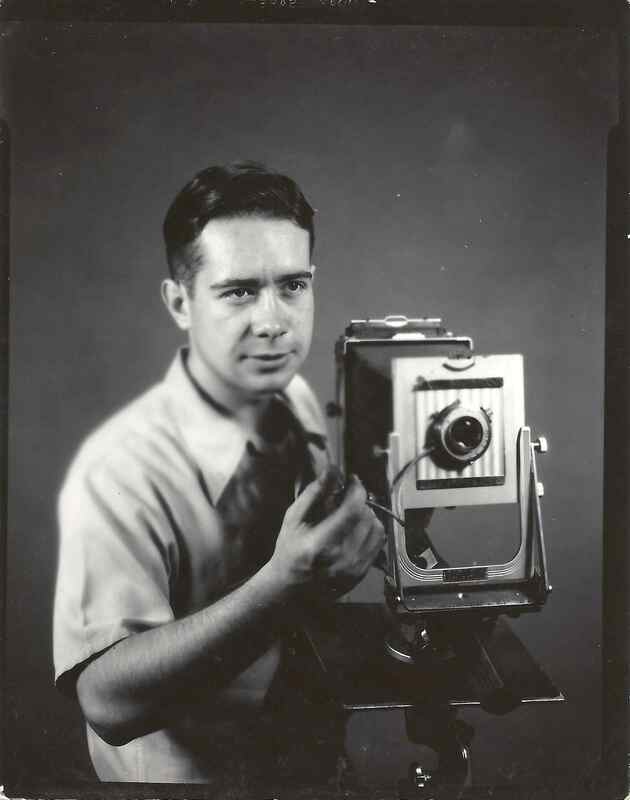 Len was the FASF’s official photographer and his advice and counsel on the upcoming FASF Museum was indispensible. It will be difficult to fill his shoes. We wish him Godspeed in his final journey. We will very much miss his positive spirit and uplifting energy. Len was a long time active member of the Aircraft Owners and Pilots Association (AOPA), whose wings are displayed immediately above. This entry was posted in HOT NEWS! on July 2, 2015 by FASFRIC.